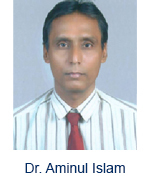 Dr. Aminul Islam (Member of IEEE since 2010, corporate member of IE(I)) received the B.Tech. degree in computer engineering from the Institution of Engineers (India), Kolkata, India, in 2001, M.Tech. degree in electronics and communication engineering from the Birla Institute of Technology (BIT) (Deemed University), Mesra, Ranchi, India, in 2006 and Ph.D. degree from the Electronics Engineering Department of Aligarh Muslim University, Aligarh, India, in 2013. Until November 2006, he was with Indian Air Force. Since November 2006, he has been in the Department of Electronics and Communication Engineering, BIT, where he is currently an Assistant Professor. His Research interests include VLSI/CAD design for classical CMOS, non-classical CMOS and non-CMOS (non-Silicon) technologies [which center around the emerging nanoelectronics and spintronics devices like FinFET, CNFET (Carbon Nanotube Field Effect Transistor), NWFET (Nanowire FET), GNFET (Graphene Nanoribbon FET), TFET (Tunnel FET), and spin transfer torque (STT)-based MTJ (magnetic tunnel junction)], Single Electron Transistor (SET), Multivalued Logic, Reversible Logic, robust design of semiconductor memory (SRAM), STT-MTJ based magnetic memory (MRAM), phase change random access memory (PCRAM), magnetic logic circuits, power- and variability-aware design, RF nanoscale device modeling, design of ultralow-power nanoscale circuits for portable/wearable/energy-harvesting applications. He is the author or coauthor of more than 61 research papers in reputed journals (21, 2 - IEEE transactions, 2 - Microelectronics Reliability, 1 - International Journal of Electronics, 1 – JOLPE, 15 others), conferences (40), and book chapter (1). Dr. Islam was a recipient of the National Scholarship (Govt. of India) for three years during study in high school in 1983, Best Paper Award for the paper entitled “Design of 2:1 Multiplexer and 1:2 Demultiplexer Using Magnetic Tunnel Junction Elements,” at IEEE International Conference on Engineering Trends in VLSI, Embedded Systems, Nanoelectronics and Telecommunication Systems (ICEVENT) in 2013, Best paper award for the paper entitled Performance Evaluation of Op Amp Using Emerging Device", at Diamond Jubilee Zonal Seminar on Advances of Electronics, Information and Communication Technology in India in 2013. 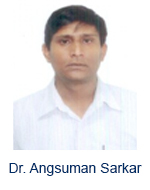 Dr. Angsuman Sarkar is presently serving as an Assistant Professor of Electronics and Communication Engineering in Kalyani Government Engineering College, West Bengal for last 4 years. He had earlier served Jalpaiguri Government Engineering College, West Bengal as a Lecturer of ECE department for 9 years. He received the M.Tech degree in VLSI & Microelectronics from Jadavpur University. He completed his Ph.D from Jadavpur University. His current research interest span around study of short channel effects of sub 100nm MOSFETs and nano device modeling. He is a life member of Indian Society for Technical Education (ISTE) and Institution of Engineers (India) and also an executive committee member of IEEE-Electron Device Society (Kolkata section). 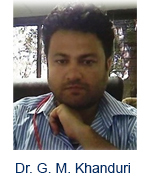 He has authored number of research papers in national and international refereed journals and conferences and books. 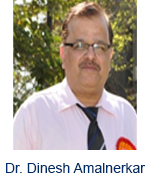 Dr. Dinesh Amalnerkar is the Executive Director at the Centre for Materials for Electronics Technology (C-MET), an autonomous research institute of Department of Electronics and Information Technology, Ministry of Communications and Information Technology. He received Ph.D. 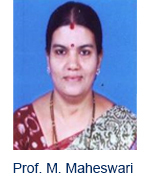 Degree in Physical Chemistry from National Chemical Laboratory (Pune University) in 1982. He subsequently worked with Elpro International Ltd (affiliated to GE, USA) as Scientist till 1985. During1986-1987, he had taken up the Visiting Assignment at Gifu, University, Japan & returned to join the post of Pool Scientist at NCL, India. In 1991, he joined C-MET as a Scientist. In March 2009, Govt. of India has appointed him as the Executive Director of C-MET to look after its 3 centers located at Pune, Hyderabad & Thrissur. While placed at C-MET, he revisited Gifu University, Japan, during September-December 1993 & August-November 2000 as an AIEJ Researcher and worked as a Brain-Pool Visiting Scientist at Korea Research Institute of Chemical Technology, Daejon, Korea during 2006-2007. He has also taken up short-term Visiting Scientist assignments at Universities and Institutes in Slovenia, Bulgaria, Saudi Arabia, Switzerland and Singapore. He has published more than 170 papers in peer-reviewed international journals, won 12 awards for oral/poster presentations in various national/international symposia. His Area of Expertise includes: nanomaterials, semiconductors, photoconductors, polymer nanocomposites etc. 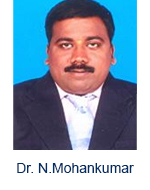 Dr. N.Mohankumar was born in India in 1978. He received his B.E. Degree from Bharathiyar University, Tamilnadu, India in 2000 and M.E. & Ph.D Degree from Jadavpur University, Kolkata in 2004&2010. He joined the Nano Device Simulation Laboratory in 2007 and worked as a Senior Research Fellow under CSIR direct Scheme till September 2009. Later he joined SKP Engineering College as a professor to develop research activities in the field of VLSI and NANO technology. He initiated and formed centre of excellence in VLSI and NANO technology at SKP Engg college at the cost of 1 crore. MoU was signed between SKP and Tokyo Institute of technology, Japan and New Jersey institute of technology under his guidance. In the year 2010 he visited Tokyo institute of technology, Japan as a visiting professor for the period of three months. In the year 2012 he visited New Jersy Institute of Technology, USA as a visiting professor for a period of 2 months. 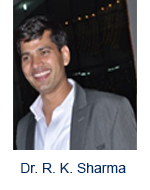 He is a member of IEEE and served as Secretary of IEEE, EDS Calcutta chapter from 2007 to 2010. He is currently the founder Chairman of IEEE EDS Madras Chapter. He has about 32 International journal publications in reputed journals and about 50 international conference proceedings. He received the carrier award for young teachers (CAYT) from AICTE , New Delhi in the year of 2012-2014 He is a recognized supervisor for research under Anna University and Anna University of technology, Chennai. At present he is guiding 12 PhD Research scholars and 12 M.E students. His research interest includes HEMT, modeling and simulation study of nanoscale transistors, optimization of devices for RF applications and characterization of nanowire MOSFETs. 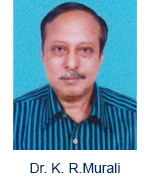 Dr.K.R.Murali is a Senior Scientist / Professor in the ECMS Division at CECRI, Karaikudi. He received his Ph.D (Engg) degree in Materials Science from I.I.T., Kharagpur, India in 1981. Then worked as a Scientist at Central Electrochemical Research Institute, Karaikudi, India for 25 years. He is having 35 years of experience in the field of Materials Science fdor Optoelectronics. His area of ecpertise includes thin film technology, electrochemistry, energy conversion etc. Dr. Rupendra Kumar Sharma is a Research Associate in the Department of Microelectronics, Faculty of Electrical Engineering at Czech Technical University in Prague, Czech Republic. He received his Ph.D. Degree in electronics from University of Delhi in 2010 and earned his postdoctoral from University of Bologna, Italy. He has also worked as a Marie-Curie Experienced Researcher in Technical University of Crete, Greece for 2 Years. He is having 9 Years of Experience in the field of semiconductor devices, his area of Expertise includes: physics based analytical compact modeling, numerical simulation of CMOS and power devices. He has authored or coauthored over 25 papers in various international and conference proceedings, recipient of Marie-Curie and Erasmus Mundus fellowships of European Union. Assistant Professor, Department of Electronics and Communication Engineering, Indian Institute of Technology-Roorkee, India. IC Design & Fabrication Centre, Deptartment of Electronics and Telecomm Engineering, Jadavpur University, Kolkata, India. Associate Professor, Department of Electrical & Computer Engineering, Michigan University, USA. School of Electronics and Electrical Engineering, Sungkyunkwan University, Republic Of Korea.